Earth, Air, Fire & Water converge in this exciting 3D slot game for huge jackpots! Play Elements Slots & enjoy unique bonuses! Earth, Air, Fire and Water come to life in this fun interactive slot game! 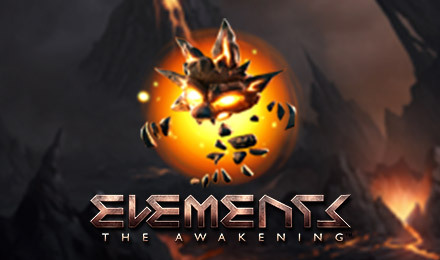 Elements: The Awakening slot game has an Avalanche feature and 4 different free fall modes, each one with a different Wild symbol. In regular spin mode the wild icon will appear only on the 2nd-5th reels, these wilds can substitute for any regular symbols but only the highest win line will be paid out. The Avalanche meter feature has 4 crystals which light up for every Avalanche, and if a player scores 4 consecutive Avalanches one of the 4 free fall modes is activated. The type of free bonus game activated is dependent upon which wild symbol is activated: Air Storm Wild, Earth Storm Wild, Water Storm Wild or Fire Storm Wild. Each Wild symbol has different functions to benefit the player, including triggering symbols to move to different reels or stay in position to create more win lines. Some Wilds (such as Water Storm) will only appear on certain reels and will expand in both directions to create multiple avalanches! Each free fall mode fills up according to a winning bet line, and each awards players 10 free falls, which are 10 free spins. During regular spins the wild icon will only appear on the 2nd, 3rd, 4th and 5th reels. These wilds can substitute for any regular icon and work with free falls too, but only the highest win is paid per line. For a truly unique and exciting slot game bursting with innovative bonus features, play Elements: The Awakening slots!